Those who attend will learn about the medical school admissions process, financial aid and the curriculum, meet faculty members and current students and tour the facility. Dr. Jennifer Rockfeld, assistant professor of medical sciences at the Frank H. Netter MD School of Medicine at Quinnipiac University, observes first-year medical students Naveen Reddy, left, and Britton Gibson taking vital signs. Photo by Autumn Driscoll of Quinnipiac University. The Frank H. Netter MD School of Medicine at Quinnipiac University will host an information session for prospective medical students from 10 a.m. to 12:30 p.m. on Saturday, Oct. 29, in the Center for Medicine, Nursing and Health Sciences at Quinnipiac, Room 105, 370 Bassett Road. 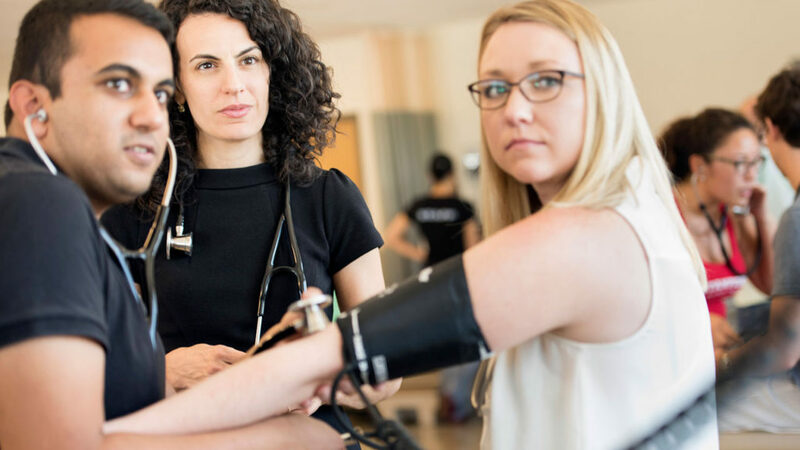 The medical school, which opened in 2013, develops physicians to become integral members of patient-centered health care teams, working closely with other health professionals to provide comprehensive care. The faculty members and administrators are renowned educators, scholars and experts in their respective medical specialties. The school’s curriculum, which includes clinical experience and research opportunities, is taught by faculty members who strive to provide a solid foundation in medical sciences. The medical school is accredited by the Liaison Committee on Medical Education, and currently holds preliminary accreditation. Full accreditation is anticipated in 2017. The school is also authorized by the state of Connecticut to award the MD degree. The school is a member of the American Association of Medical Colleges. Clinical affiliations include St. Vincent’s Medical Center in Bridgeport and Trinity Health-New England, Inc., as well as many other hospitals. The school is named for Dr. Frank H. Netter, a world-renowned medical illustrator whose drawings and atlases have educated medical students for decades. For more information, please visit www.qu.edu. Connect with Quinnipiac on Facebook at www.facebook.com/QuinnipiacUNews and follow Quinnipiac on Twitter @QuinnipiacU. To register for the information session, please visit www.eventbrite.com/e/oct-29-2016-netter-info-session-tickets-27287298043 or call 203-582-7766.